Experts have raised concerns about a UK-based online medical service which offers the contraceptive pill without the need to see a doctor. The DrThom site is offering three months' supply for £29.99. Over-18s must supply their medical history before getting a private prescription from the site's doctors. But a Royal College of Obstetricians and Gynaecologists spokesperson described the lack of blood pressure checks as "less than ideal". The website is initially offering the service to women who say they are already on the Pill, rather than those wanting their first prescription. 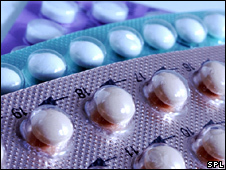 However, it plans to offer first prescriptions for oral contraceptives "in the near future". The site is effectively an online private doctor service, and as such is registered with the Healthcare Commission. Doctors who prescribe after a telephone or online consultation are also bound by General Medical Council rules, which state they have to carry out an "adequate assessment" of the patient's condition, and keep track of their progress. The website uses a questionnaire, with doctors able to ask supplementary questions, and the website's spokesman said this could be as reliable as a face-to-face consultation. However, he said there was no way to confirm that the patient was who she said she was, although the credit or debit card used would have to be in their name. "A woman has to say how old she is and as part of the registration will have to supply their date of birth, but there's nothing to stop somebody who is 17, lying about their age." Dr Thomas Van Every, DrThom's medical director, said the aim of the service was to make it easier and more convenient for women to get access to the Pill. The government has said that it plans to make access easier, potentially by making the Pill available over-the-counter at pharmacies, and Dr Van Every said the new service was "consistent" with this. The most commonly-prescribed version of the Pill carries a small risk of blood clots. Dr Beverley Hunt, from the thrombosis charity Lifeblood, said that most women with a higher risk of this, would be picked up by the health questionnaire, if this was answered truthfully. But Mr Peter Bowen-Simpkins, a consultant gynaecologist and spokesperson for the Royal College of Obstetricians and Gynaecologists, said that face to face consultation, either at a GP surgery, or family planning clinic, was better. He said: "Not only are you relying on the honesty of patients on things such as their, and what other medication they are taking, but in this situation you can't carry out blood pressure tests, not just when you prescribe, but three months later. "It is less than ideal." Kate Guthrie, from the Faculty of Sexual and Reproductive Health, part of the Royal College, agreed that robust checks were needed for first-time oral contraceptive patients, but said that for established users, online suppliers could be safe. "These sites do have potential for people who have been happily using oral contraceptives for some time, and just need a fresh supply." The Royal Pharmaceutical Society is already supporting moves to make oral contraceptives available over-the-counter from pharmacies. However, this would involve a face-to-face consultation with a pharmacist, and other checks such as blood pressure tests, which would normally be carried out by a GP before prescribing oral contraceptives for the first time. Emergency contraception - the "morning after pill" - is already available this way. A spokesman for the Department of Health said that contraception was available free from the NHS. She added: "GPs and hospital doctors are, of course, ultimately responsible for their own prescribing decisions. "They should always satisfy themselves that the drugs or other substances they consider appropriate for their patients can be safely prescribed, that patients are adequately monitored and that, where necessary, expert hospital supervision is available."